Chert is a chemical sedimentary rock that is made out of mostly silica (one of the forms of silicon dioxide, or SiO2). The silica within chert occurs as microcrystalline or cryptocrystalline (meaning microscopic) quartz crystals, and this gives chert many of its unique properties. 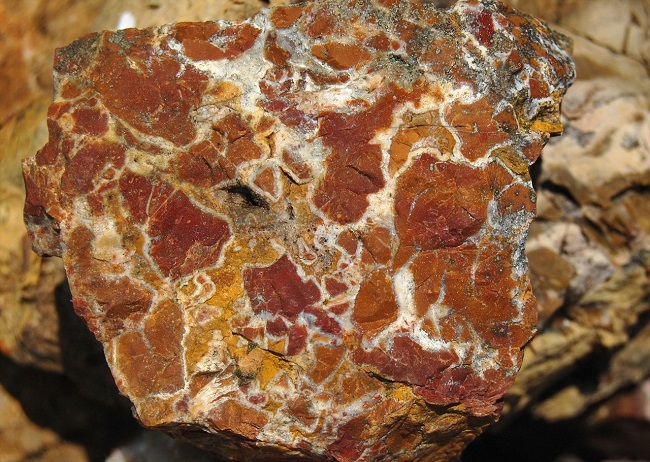 This rock typically forms in horizontal bands, beds, nodules, and concretions. With a little bit of background knowledge, chert is easily recognized, and humans have found many ways to take advantage of its unique properties. Unlike clastic sedimentary rocks, which form when clastic sediments are deposited and lithified, chert forms from the precipitation of silica. As a result, the mechanisms behind chert formation are not necessarily as well understood as some other rocks like sandstone or shale. Chert may form, for example, when groundwater flows through a permeable rock like limestone and deposits silica as tiny crystals. These crystals will slowly grow until they create chert. As a result of this process, chert is frequently found in conjunction with limestone or dolostone. Chert may also be formed in part from biological action. Many animals construct their skeletons out of silica; examples of these creatures include diatoms, radiolarians, and sponges. These skeletal elements can provide the necessary silica needed to make chert. Chert may also be precipitated near hydrothermal vents. Because chert is made of mostly quartz, it has a hardness of seven and can therefore scratch glass and steel. It is also a tough, brittle rock and resistant to erosion. Chert fractures irregularly; this type of breakage is called conchoidal fracturing. The edges of these breaks are incredibly sharp and hold their edges well. Another unusual property of chert is that it emits sparks when struck with steel. Chert comes in many different colors due to the presence or absence of various impurities. It may be white, gray, black, pink, red, yellow, green, light blue, or even brown. Chert is relatively easy to identify. 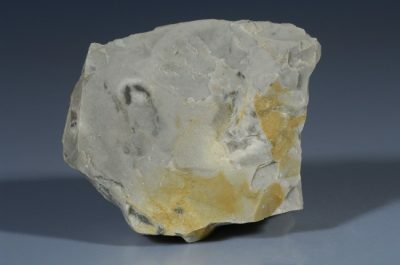 Chert often occurs in rounded nodules and has a dull, frosted glass-like surface. It is commonly found in or near beds of limestone or dolostone, and it will not react with acid because it does not contain calcite (calcium carbonate; CaCO3). Unlike sandstone, conglomerate, and many other sedimentary rocks, chert does not have visible grains. It breaks irregularly in conchoidal fractures that produce sharp edges; such breaks are easily recognized and can often be seen on fragments of chert that are weathering out of a rock outcrop. Chert can scratch glass and steel. Due to the many possible colors of chert, color is an unreliable method of identifying this rock. There are several different varieties of chert. Below are listed some of the more common types or synonyms of chert. Flint is a term commonly applied to darker, slightly denser forms of chert.2,4 There are otherwise no differences between “flint” and “chert,” and the two terms are often used interchangeably. Jasper is a type of chert stained red by iron oxide impurities. Novaculite is another member of the chert family. It is typically slightly metamorphosed but otherwise very similar to other types of chert. It is often used as a sharpening stone. Chert was very important to early humans for several reasons. 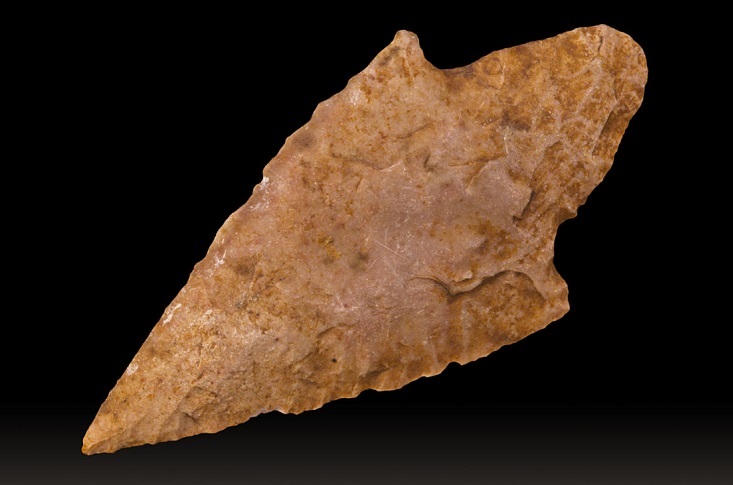 Due to its ability to both make and hold sharp edges and its ability to be broken into desired shapes, chert was commonly used to make arrowheads, spearheads, scrapers, and other tools. Archaeologists have been able to infer ancient trade routes by looking at where chert was mined and transported. In addition to making tools, chert has been used to make fire due to its ability to spark when struck with steel. More than merely making fires, however, chert was also used to make the sparking mechanisms in flintlock rifles. In modern times, chert is most commonly used for gravel. Novaculite, one of the varieties of chert mentioned above, can be used to sharpen knives. Chert cannot be used as a concrete aggregate: some cherts react with high-alkali cements, which destabilizes the concrete by causing it to crack or expand. 1. What causes the different colors in chert? 2. Which rock is chert most commonly found with? 3. Why was chert commonly used to make tools by early humans? A. It is resistant to acid, which made it durable. B. It is easy to find. D. It makes and holds sharp edges when broken. 4. Which is the mineral that chert is made out of?